Be aware that the start and end times for each session are tentative. Check back for updates before the show. The information contained herein is subject to change without prior notice. 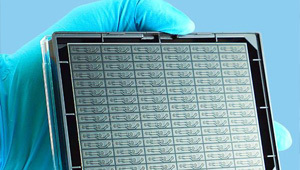 We have developed the next-generation method for microarray synthesis: For the first time, it will be possible to cost-efficiently generate any kind of large scale high-density molecule microarray. For example, this will allow us to screen the whole malaria peptidome at once for vaccine research. Key feature of the new method is a laser transfer process. Tiny solid material spots are rapidly transferred from a donor film to an acceptor surface, requiring only minute amounts of materials. The transfer is performed with different and easy-to-produce donor slides. Each donor slide bears a thin polymer film, embedding one type of monomer. The coupling reaction occurs in a separate heating step, where the matrix becomes viscous and building blocks can diffuse and couple to the acceptor surface. This novel method allows us to incorporate any synthetic or commercial building block into the array’s molecules with a density of 10,000 spots per cm². Especially in the area of drug discovery, tissue engineering and organ-on-chips are becoming more important. However, handling is often time consuming and difficult due to a lack of automatized systems. We present a microfluidic platform that is used to cultivate slide-sized organ-chips. 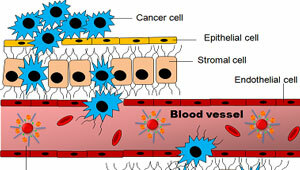 Within the chip, endothelial cells grow on a curved microchannel, to create an artificial blood vessel. 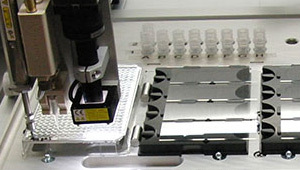 Several organ-models can be built in a surrounding compartment, which can be used for various applications like drug testing. The platform itself consists of a micro annular gear pump that enables flow rates down to approx. 1.5 µl/min and several miniaturevalves. The platform is controlled by a connected touch display. Because of the dimensions of a multi-well plate (127.8 x 85.5 mm2), the platform fits to standard devices, like microscopes. Furthermore, there are fluidic connections for sampling as well as the possibility to integrate sensors (e.g. O2, CO2) via Luer-Locks. We have printed sensors for usage in cell-based assays. Graphene platelets are the main component of the ink. 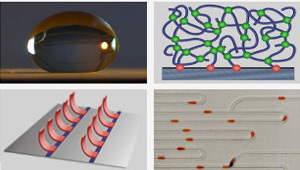 Roll-to-roll gravure printing is used for printing 5 µm thick interdigital electrode structures. Inline drying of printed structures is performed with near-infrared dryers. 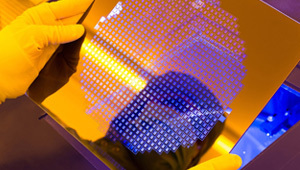 Thin polymer films comprising the printed sensor structures in multiwell plate format are bonded to bottomless well plates and electrically connected with an impedance analyzer. 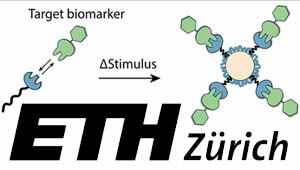 The TZM-bl / HIV-1 pseudovirus (PV) system is used for sensor validation. In the validation experiments 10,000 TZM-bl cells are seeded per well. The PV PVO.4 (in a concentration usually used in neutralisation assays) or PVO.4 plus 1 µM Efavirenz are added to the wells 24 h after cell seeding. We have shown that the developed sensors are suitable for online monitoring of the viral effect on cell culture and inhibition of the virus-induced cytopathic effect by antiviral substances. IMMS serves enterprises through preliminary research. 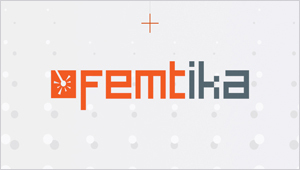 It acts as their strategic partner in the development of microelectronic and mechatronic products and of systems technology. 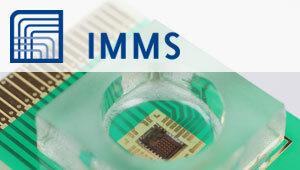 IMMS’ life science focus is the research and development of application-specific integrated electronic circuits (ASICs) and sensor systems for quantitative rapid tests and in-vitro diagnosis and for the monitoring of therapeutic progress. The biotechnological know-how of its partners is the starting point for joint development of customised systems. For those systems, IMMS concentrates on optical and electrochemical detection in combination with wireless data transfer. Examples from previous research projects will be presented, as for example a wireless, battery-free temperature sensor and a mobile box for the detection of antigen-antibody interactions. For future developments IMMS will combine optical or electrochemical sensing with wireless energy supply and data transfer for the development of sensors which can be read out e.g. by smartphones. 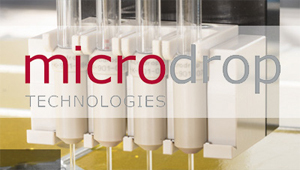 The usage of microfluidics for marine science is shown in two examples: one analytical instrument (nutrient analyzer) and one sample treatment device to mimic environmental conditions. In context of droplet microfluidics, fluorescence activated droplet sorting is one of the most widely used sorting technique. The herein predominantly used method for droplet detection based on fluorescence intensity is easy to realize but can be error prone. 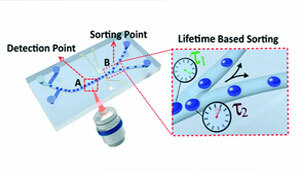 An interesting alternative is to read the fluorescence lifetimes of individual droplets rather than just the intensity. Furthermore, it allows to better differentiate between analytes and also enables to probe the environment of the fluorescent molecule, e.g. for sensing applications. We manifest a novel technique to sort droplets by on-the-fly fluorescence lifetime determination. 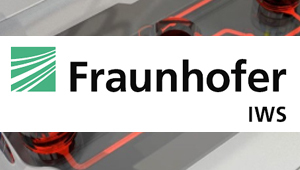 The system enables sorting of droplets containing fluorescence compounds as Fluorescein and Pyranine by average fluorescence lifetime with a high accuracy of sorting. Tropoelastin is an extracellular matrix protein containing long stretches of disordered amino acid sequence. By utilizing tropoelastin’s repetitive VPGXG motif, we have engineered versions of artificial elastin-like polypeptides (ELPs) for bioseparations and biosensing. ELPs are useful reagents for biochip systems because they undergo a reversible phase transition in response to small changes in environmental conditions, such as changes in ionic strength and pH. After describing the relevant background on ELPs, I will present two systems involving newly engineered ELPs. The first system uses bio-orthogonal ELPs for fabrication of biosensor surfaces with improved sensitivity, while the second system demonstrates magnetic nanoparticle-based separations of ELP fusion proteins. These technologies demonstrate the broad range of biochip applications where ELPs can be of use. Chronic Obstructive Pulmonary Disease (COPD) is one of the most common chronic lung disease worldwide. Although majority of patients with objective COPD go undiagnosed until late stages of their disease, recent studies suggest that the viscosity variation of sputum samples collected from patients could be an indicator of the disease progression. 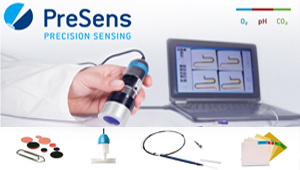 Since, the viscosity of the sputum is defined by its water and protein contents, it is possible to use dielectric sensors for rapid screening and detection of sputum variations. Therefore, the main content of my presentation at BioCHIP conference will be to introduce our BiCMOS biochip/biosensor which is developed for rapid diagnosis of COPD through dielectric characterization methods. The small size, DC readout mechanism, and low power consumption of the developed sensor made its fully integration into a handheld device possible. The operating frequency of the dielectric sensor was chosen to be 30 GHz to achieve a high signal-to-noise-ratio. Roll-to-roll (R2R) production is applied in many fields ranging from print industry to organic electronics and lab-on-a-chip technology and brings an increase in throughput, decrease of production cost and simplification of substrate handling. 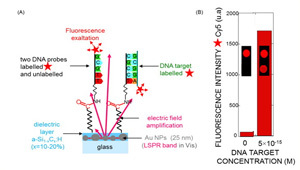 In this study, a foil based biosensor for chemiluminescence based DNA quick tests is presented. The sensor microchannels were produced by R2R UV-NIL, showing the transfer of the chip concept from classic injection molding to R2R based production. In addition, R2R produced optical microstructures for signal enhancement were implemented on the chip bottom. 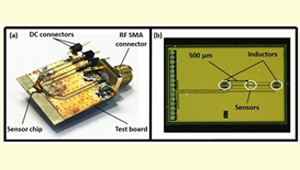 Optical signals, generated inside the microfluidic channels, are coupled out of the chip with higher efficiency and signal strength is increased. The implementation of DNA printing of the biosensor is also transferred to a R2R process. A novel R2R Microarray-spotter is presented, which allows high resolution printing of multiplexed biomolecule arrays on R2R imprinted microstructures. 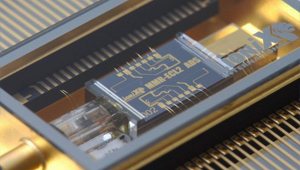 This technology enables high throughput production of biosensor chips. The increasing distribution and acceptance of Point-of-Care devices creates the need for disposable highly sensitive biosensor devices. Specialized microelectronic sensor chips combining superior sensitivity compared to paper strips and better miniaturization potential, production scalability and readout simplicity compared to optical systems are emerging from science to application. Packaging of these sensors into a disposable component needs to comprise electronic connection as well as sensor-to-fluid exposure and the respective interfaces to the “macro world”. Reaching feasible costs for such integrated hybrid microelectronic-microfluidic components is possible by saving highly expensive silicon substrate area and place the non-active functionality such as electronic and fluidic wiring onto cheaper substrates. During the presentation two packaging technologies addressing different product requirements will described. Therefore, the development of two dedicated process flows will be outlined, that allow the packaging of two sensor variants by using microelectronic packaging processes suitable for cost effective medium to high volume manufacturing. Both sensor packaging process variants have been validated by actual sensor embedding and functional testing in cooperation with sensor developers. We investigate how to ubiquitize healthcare by moving the process of diagnosis closer to the patient. What if instead of laboratories, doctors themselves could perform the tests while patients wait? Or, what if we could empower patients to perform selected tests at home, as part of their decision whether to see a doctor? I pursue this vision by creating cyber-physical systems based on biochips, electronic devices that manipulate droplets of fluids to execute “bio-protocols”. 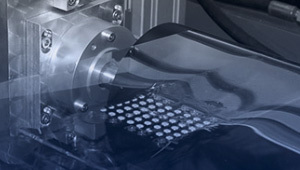 Biochips automate processes traditionally performed in wet labs. Instead of going to a specialist, a patient could download a bio-protocol. This transforms diagnosis into a software problem that has the potential to scale the way software scales. I design biochips that can be operated at the level of expertise of doctors and patients. Specifically, I develop biochip hardware, write compilation software, and I am currently working on a user-facing system to edit bio-protocol interactively. Various microfluidic platforms have been developed in the past couple of decades offering experimental methods for the study of cell migration, yet their implementation in the laboratory has remained limited. This is mainly due to technical complexity, high failure rate due to gas-bubbles, as well as questionable bio-compatibility of polydimethylsiloxane (PDMS). We have designed and implemented a system that creates microfluidic circuits using only materials commonly used by biologists - standard cell culture dishes and media. The media is shaped into microfluidic patterns onto a petri dish and overlaid with an immiscible perfluorocarbon to form fluid-walled circuits. Cells may be added anywhere to the open microfluidic format and flow driven from any point within the circuit by passive or active means using principles of Laplace pressure. Novel devices were fabricated, and to demonstrate the functionality of this system we performed cell migration based assays. Rapid and accurate detection of pathogens is a major challenge in many areas including health, food safety or military applications. For this purpose, biochips are particularly attractive as they allow multiplex detection of pathogens at relatively low costs and fast. Different methods with good sensitivities were already developed however they are not able to verify the nature of the detected pathogens or to identify their strains. Thus, we aim to develop a new architecture of biochip for the multiplex and spectroscopic identification of pathogens by SERS imaging. Our biochip design is based on amorphous silicon carbon alloy and plasmonic nanostructures. Briefly, the amorphous layer allows the reproducible fixation of different probes (mannoside or antibody) via robust covalent Si-C bonds and the plasmonic nanostructures are responsible for the exaltation of Raman signal of the targets. Afterwards we will focus on selectivity, sensitivity and on the limit of detection of our method. In clinical diagnostics complex patterns of biomarkers such as cytokines, e.g. for Systemisches inflammatory Response-Syndrom (SIRS) diagnostic play a vital role. The mortality rate of SIRS patients is 10 %. Therefore, it is important to detect SIRS in a fast way. The SIRS relevant biomarkers (IL-4, IL-6, IL-10, TNF-alpha, IFN-gamma and PCT) are low concentrated (pg/ml) in a sample. Hence, it is essential to develop a high sensitive biochip to detect these markers in parallel within a small sample volume (25 µl). Here, we present a microarray based assay with a high sensitivity for a fast diagnosis of SIRS on one chip. The results show the detection of all six biomarkers with a high sensitivity and broad dynamic measurement range in one chip. Especially for Procalcitonin, the dynamic measurement range is between five decades. Multi-organ platforms have an enormous potential to lead to a paradigm shift in a multitude of research domains including drug development, toxicological screening, personalized medicine as well as disease modeling. We have developed a plug&play multi-organ system that combines a microfluidic base chip, featuring integrated micro pumps, valves, reservoirs and oxygenators, with ultra-compact microphysiological tissue modules, comprising various types of µ-tissues. 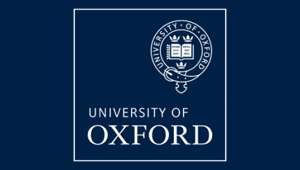 Both systems can be interconnected with temporal flexibility, whereby pre-cultivation of the individual modules is possible. 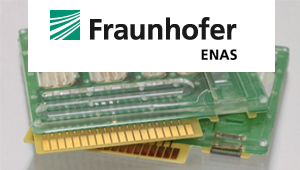 Since both the individual modules and the base chip are transparent, it is possible to monitor the µ-tissues as well as the flow architecture using (fluorescence) microscopy. The concept moreover allows the integration of multiple individual μ-tissue modules with the superordinate basis chip. This approach creates for the first time a fully customizable multi-organ-chip platform within a closed circulation system. 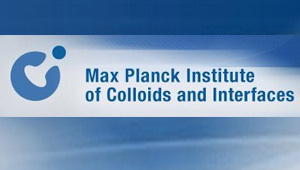 For this purpose, defined fluidic interfaces have been developed and established. CubiX is a plug & play and versatile microfluidic platform to cultivate for long term (1 to 7 days) complex 3D biological models (spheroids, organ on a chip and tumor biopsies) in physiological conditions. 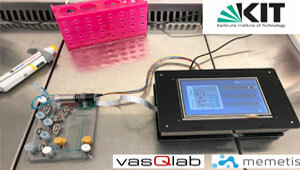 We already internally developed and designed a series of microfluidic chips to support specific biological applications. In this presentation, we will focus on presenting the results obtained with skin and melanoma on a chip as well as kidney tumor on a chip. Both of these results were generated using either a proprietary microfluidic chip or commercially available solutions. A special emphasis will be given on the specific chip requirements related to each model to highlight the versatility of CubiX. Choline is an essential nutrient that is crucial for normal cellular function and its deficiency has an impact on disorders such as liver disease, atherosclerosis and possibly neurological disorders and increases the risk of multiple cancers. Therefore, it is necessary to develop a fast and sensitive method for choline detection. The development of innovative biochips holds a great promise for the fabrication of smart and low-cost portable devices, which play an important role in future food industry, healthcare and diagnosis of mentioned diseases. 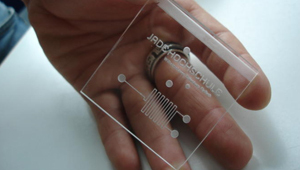 Screen-printed electrodes (SPE) proved to be suitable for further modification and miniaturization, which make them more attractive and ideal for commercial development of biosensors. 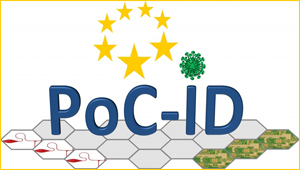 Consequently, modification of SPEs with hybrid composites based on carbon nanomaterials and ionic liquid with unique and highly attractive properties will provide the best candidates for choline oxidase immobilization and develop a choline-chip for choline detection in food samples or biological matrices. BIOCHIP Berlin is devoted to dialogue, discussions and innovations for manufacturing, technology and applications. The conference will provide a spectrum of opportunity to expand knowledge and share new concepts amongst the Technologist, Professionals, Industrialists, Researchers, and Innovators from the field of biochips and biochip solutions. This is your opportunity to get information on the latest developments, participate in interdisciplinary discussions and profit from expert knowledge and an intensive know how exchange. Adlershof con.vent. Rudower Chaussee 17, 12489 Berlin, Germany. Speaking opportunities are open to all qualified applicants. 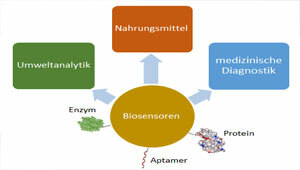 BIOCHIP Berlin reserves the sole right to accept or reject any proposal received without liability. Each speaker will receive 15-30 minutes of presentation time. Proposals and presentations must be in English. Each proposal will be evaluated based on many factors including current principal needs, interests, and commitment to bringing new and innovative content to conference participants. BIOCHIP Berlin does not pay for a speaking fee. Travel related expenses, meals and ccommodations are the responsibility of the speaker. If attendees are charged a fee, the speaker shall submit requests prior to the event for review and approval by BIOCHIP Berlin. Your presentation is meeting place for your professional connections. As a presenter you might wish to invite audiences and give them complimentary tickets. Our “Invite & Meet” Customer Ticket Package (discounted invite tickets) offers a marketing tool you can use to invite guests to attend your presentation and meet each other without paying admission. All sessions are free to attend by general admission ticket holders. 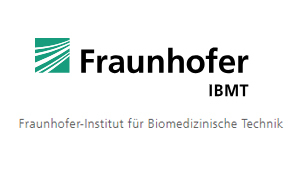 The organizer of BIOCHIP Berlin invites proposals for special sessions to be held during the main conference from 7 to 8 May, 2019 in Berlin. For submissions or inquiries please email info@biochip-berlin.de.